•	Run Anti-Spyware tools like Ad-Aware Pro SE or HiJackThis. •	Use MSConfig to configure what apps start on login. •	Read and write to NTFS and FAT partitions. •	Edit the registry on the local hard drive. •	Copy files off of a hosed machine to another computer over the network. •	Use MMC and Disk Manager to partition drives. •	Defrag the hard drive with out booting from it (running defrag this way does a better job since there are no locked system files on the hard drive). •	Load the CD with SSH, Remote Desktop Client and VNC so you can use the boot CD as a workstation. •	Recover deleted files from slack space. •	Perform a byte for byte wipe of the hard drive so others can't recover deleted files. •	Read event logs off the hard drive. •	Undo Syskey and get password hashes for later cracking if you lost a password. •	Use Internet Explorer and Firefox from the boot CD to surf the web. •	Run security tools for checking your network. •	Make a locked down web terminal for patrons. Since the CD is read only media deviant users can do little to corrupt the workstation that can't be fixed by a quick reboot. One great use for a PE Builder CD is to remove spyware from a computer and that is the task that this article will focus on. A lot of spyware is hard to remove when you are running the removal tools while booted in the Windows OS from the local hard drive. Some spyware will try to reinstall itself as soon at its files or registry keys are deleted. You can get around some of these problems by running the anti-spyware tools in safe mode, but even then some spyware can find a way to keep itself alive. By booting a copy of Windows from a boot CD and running tools like Ad-Aware and HiJackThis you can eliminate this problem almost entirely. The current version as of this writing is 3.1.3. For convenience download the EXE self extracting package and let it install to the default location (C:\pebuilder313). Next you need to copy the setup files from a Windows XP SP2 install CD to your hard drive. If you do not have an XP Pro CD integrated with Service Pack 2 just copy the files from the one you have and integrate SP2 yourself using the Source->Slipsteam menu option in PE Builder. I chose to copy the files to a folder called C:\WinXPProSP2-CD\ and will be using that path in this tutorial. 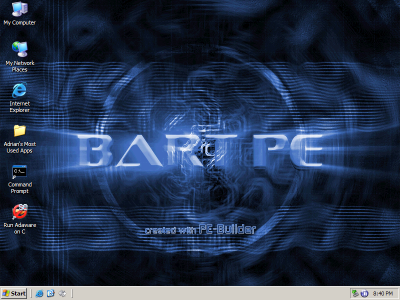 Bart's PE Builder comes with a lot of useful plugins but there are a few more you will want to download and setup before you begin creating your own boot CD. Once you have everything downloaded you need to extract all of the files into C:\pebuilder313\plugin\. Many of the plugins come as CAB archives so if you don't have software to extract them just use the Add option when you select your plugins in PE Builder. Each of the plugins should come with an HTML file detailing how to install the plugin and what files you will need to copy from your system to the plugin directory, where to download them from, and where to put them. For example, Paraglider's Ad-Aware SE Pro needs you to install Ad-Aware on your system and copy the files from "c:\Program Files\Lavasoft\Ad-Aware SE Plus\" into the "Files" folder inside of the Ad-Aware plugin's directory. The HiJackThis plugin needs you to download the HiJackThis executable from http://www.spychecker.com/program/hijackthis.html and put it in the files folder in the HiJackThis plugin's directory. Now that we have everything downloaded start up PE builder by running C:\pebuilder313\pebuilder.exe. Choose the path to the Windows XP Source Files (C:\WinXPProSP2-CD) which you copied to the hard drive earlier. You will most likely see two Ad-Aware plugins. The one labeled as "Ad-Aware SE Pro" is the one you want enabled, make sure the plugin labeled as just "Ad-Aware SE" is disabled. Once you are done enabling and disenabling plugins click the "Close" button. "txtsetup.sif","SetupData","loaderprompt","""Starting Windows XPE [The Horse Power]..."""
And change "about:blank" to whatever home page URL you wish IE to use. If all of this is too much for you just download my z_xpe-custom.inf from http://www.irongeek.com/i.php?page=security/pebuilder . Then you can just skip the customization steps above. Once all of the customizations are done go back to the PE Builder program. If you want PE Builder to burn the CD for you check the "Burn to CD" checkbox and select your burner. I prefer to use Nero to burn the ISO myself but you can choose any CD burning software you like. I recommend using a CD-RW for your first few attempts at making a boot CD. CD-Rs are compatible with more CD drives but CD-RWs can be used over and over again for testing CD images as you construct new PE Builder CDs with different plugins and options. Check the "Create ISO image" check box then click the "Build" button to generate an ISO of your CD. Click "Yes" and "I agree" on the two windows that pop up and Bart's PE Builder should begin to build your CD. After you burn the ISO, test the PE Builder CD by rebooting your computer, going into the BIOS, and setting the CD-ROM as the first boot device. On some computers there's a function key you can hit at boot up that will let you choose the drive to boot from (it's F12 on most Dell's made in the last few years). Once you boot from the CD you should see the Windows's Classic Start menu interface. Assuming the proper drivers are on the CD you should be able to get a network connection and surf the web or connect to a file server. You can also try defragging, copying files to and from or partitioning the local hard drives. When you use Ad-Aware make sure you set it to do a custom scan and point it to the C: drive. Below is a list of other useful security, Anti-spyware and recovery plugins for Bart's PE Builder I did not include above for the sake of space and simplicity. If you have any problems setting them up feel free to contact me, or better yet look at the web pages listed in the "Further Research" section at the end of this article. Great for finding out what hosts are on your network. Great for scrubbing the hard drive clean of all data. Use these plugins to run the Firefox web browser from your boot CD. Normal a PE Builder boot CD only looks for hardware on startup, but if you plug in something like a USB thumb drive after you boot, PE will fail to find it. The HWPnP plugin will allow you to plug in USB devices anytime you like. Great tool for bypassing Syskey and grabbing password hashes from the SAM file. I use the older SAMInside v2.1.3.0 version because the newer demo versions disable the export to PWDUMP file option that's useful for importing into L0phtcrack. The Keyfinder-PE plugin will extract the XP registration key from the hard drive. Sometime you may need to do finer work to the registry then Ad-Aware or HiJackThis will allow. Registry Editor PE lets you load the registry hives off of the local hard drive and edit any key you like. Sam Spade is a collection of useful network tools for finding out information about hosts on the Internet. Sam is quite popular with spam-fighters. Password Renew lets the user change the password of the local Administrator account or create a new admin level user with a password of their choice. This is a great tool for getting into Windows boxes you don't have an admin password for. I hope you have found this article useful. If you have any questions or comments please feel free to e-mail them to me at Irongeek@irongeek.com.